Updated the D Programming FAQ. Not much of an update, but I've added an entry into the FAQ that I thought had a useful answer, which I and others can use as a reference for the future. Well, I hope everyone is enjoying the Spring-time weather! :)) I know I am. Also added a link for Charlie's Elephant v0.12 IDE for the D programming language, to the "Tools to use with D" section. 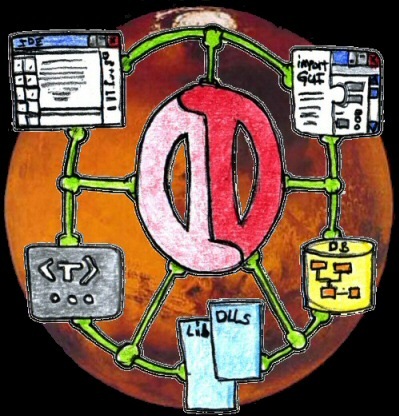 Added DateConv.d v0.1 and added DigitalMars D forum links. This past week I ran across a small problem, when I was writing some D code to read in some C binary data structures that had 32-bit date/time information I needed to convert. So, after re-learning which C date/time functions to called and their formats and etc, I ended up writing a couple conversion functions for DateConv.d v0.1 which I've placed into the "Support Project 2" section. Hopefully someone else will find it useful in some future project. Also with the new "announce" (for any type of D announcements) and "learn" (for beginner questions or generally simple questions) forum areas that Walter added last week, I've added a new "D Forum Links" to the left-side menu. Added more detail information for setting up D.
As D moves closer, ever so closer to a golden v1.0, the D user group continues to grow and being join by newer programmers from different languages who've only used IDEs to edit and compile their programs. Which many are finding themselves a bit lost in just now to compile D programs from the command-line. For this purpose I've added a couple of new pages under the "D Info & Setup" section to show how to setup XP's path environment variable for D, and how to open up a command-line window to do a simple compile of the "Hello.d" program example that's included in the D compiler install zipfile. Also "ConvExt.d" has been pulled from the site, waiting on Walter to add its functions into Phobos' "std.conv.d" import file. Hopefully the next build. :) Currently the DynStrStack.d v0.2 sub-project code still has a need for these functions, so ConvExt.d is still included, but the license has been changed to DigitalMars...which it will be removed from that project as soon as the functions are included in the new D Phobos build. Updated the MKoD D Examples to D v0.114. Re-Zipped all the "MKoD D code examples" with few new entries, and added in the "D Programming 101" code, then retested and recompiled them all with D v0.114. The zip-file can be down-loaded from the "D/L D Code / Stuff" section. Also I've updated the "D Programming FAQ" and "D Programming 101" sections with one new entry each. Updated RandomDataXML (XML input files) to v0.44. Doubled the number of male and female first names used in the "Random personnel names and addresses generator" project, which currently creates a xml file that then can be imported into a company database's personnel table(s) for testing data purposes. Also I had to pull two broken D website links from the side-menu for "Atari-Soldiers" and "Andy's D Page". Updated the "How to install D" page. Well, it looks like Walter has been pretty busy lately rearranging some of the links, and grouping them together into logic positions. Thus I've felt the need to update my notes a little bit with a recaptured up-to-date screen-shot, so that the "How to install D" page can remain helpful to newcomers. Created mathext.d, to place a handful of additional math functions that aren't in either the std.math or std.math2 modules, and placed the file in the "Support Projects 2" section. Updated RandomDataXML (XML input files) to v0.42. Increased the USA_street_names.xml file entries from 1,000 to 4,000 street names, and recomplied and tested the Random Data D Code with D v0.111. Added a "Darian Mars Date/Time" clock to the site. One Solar day is 24:39:35.2 (hrs:min:sec) in Earth time (a Martain Day is called a Sol). One Martain Year has 668.5921 Sols. In the Darian calendar the year has 24 months each with 27 / 28 Sols. Added DateUtils v0.2 and Updated the FAQ. Added the DateUtils v0.2 project to "Support Projects 2" which is a small project that has a few handy date functions, plus I've recompiled and tested the DynStrStack and ConvExt projects with dmd v0.111. Also I've added a few helpful entries to the "D Programming FAQ" section. Over the past few days I've created a new "Imbedded x86 Assembly" category entry to the "D Programming 101" section, which uses Intel's x86 assembly for two very useful functions: isPrime() and factorial(). Plus I've added a new entry which is a port of Steve Litt's findPrimes(), that can be found in the "Basic D Tutorials" section. Updated RandomDataXML (XML input files) to v0.4. My D aka Mars Wish-List Framework for 2005. "Happy New Year 2005 everyone!!" To see the D v1.0 complier released. For both the Windows and Linux versions to finally become balanced equals. To have a standard IDE with a callable debugger (maintained by D users). Charlie the original author of D IDE which he retired, has posted on 22.Mar.05 that he has written a new D IDE call "Elephant" that's ready for testing, which can be found here: Elephant v0.12. Which has the ability load and save a project / namespace. And of course to have keyword syntax hightlighting. Graphic tools for D UI creation [upper right]. Would be nice to have graphic UI tools written in D for D.
Have a common graphic framework interface wrapper, so Windows GDI, OpenGL, or DirectX APIs could be chosen. Maybe even have a resource editor for icons, cursors, menus, and such. Better Database support for D [mid right]. Have a number of Database interfaces to common APIs for D.
To have a Database Application that acts as a Version Source Safe for D code, which could interact with the IDE (good for larger projects). Improved support for linking in static .LIB, and stronger support for Dynamic Librarys [bottom]. To have easier to use "Make" and "Build" tools / scripts. A way do see if a .LIB is in COFF or OMF format. A way to call and use Classes within a .DLL. A standard D Template Library [mid left]. For Matthew Wilson's DTL (D Template Library) to reach v1.0 this year. From Walter's post 3rd March 2005: "...DTL is probably going to be a D 2.0 feature." To have Ben Hinkle's MinTL v2.2: which exists now, to becoming a part of the DTL above (which is happening, as I understand it). All and all, it does sound like I'm wishing a lot for a Visual Studio of Applications for D of sorts, using maybe the IDE as the main app, which uses other support applications, as stand-alone executables or as true plug-in type apps. "But, if you're going to dream...it's best to have a really good Dream!"